Earlier I posted about entering a ham contest for the first time. Being licensed as Novice, I could only utilize the 20m band in the European PSK DX contest as stated by the rules of the contest. I expected to end up really low, if not last, i didn’t have enough time to put into the contest because of the formula 1 races among other things that weekend. 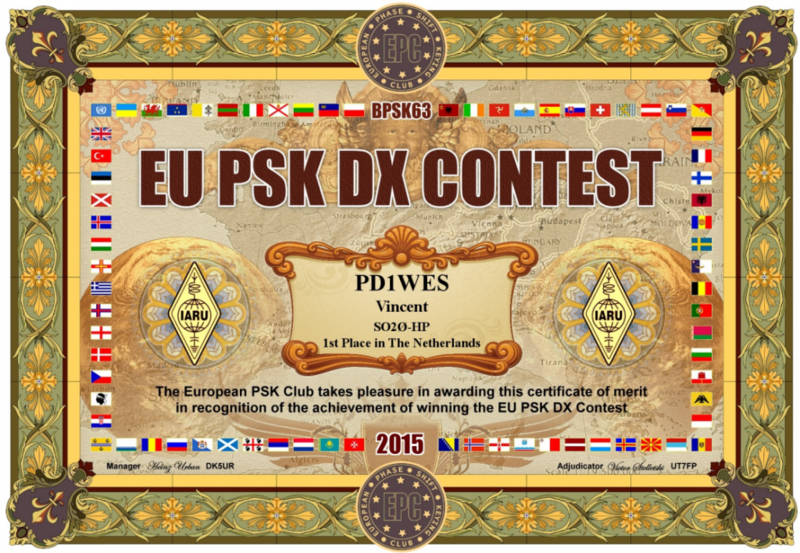 Thank you very much for your participation in the EU PSK DX 2015 contest, for your interest and support of the digital modes. The European PSK Club congratulates you on your achievement! We are looking forward to see you in the coming EPC Contests. 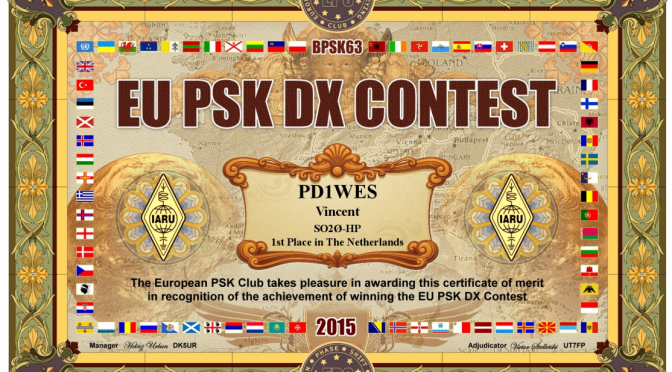 Last weekend i entered my first radio contest, the European PSK DX contest. As i never contested before i didn’t really know what to expect or how well my station and i myself would perform. The days leading up to the contest i prepared my station, tested if everything was setup right and edited some macro’s. I was planning to go for a ‘Searching and Pouncing’ approach, hunting for CQ calls, i made sure to have to the point macro’s. As a novice, i could only utilize the 20m band mentioned in the rules: http://www.eupsk.com/eupskdx/eupskdxrules.pdf . Lucky for the dutch novices like me, there is also a 20m-only category to contest in. After sundown it became a bit more difficult so i took a break. Returning into the contest later on, i managed to contact a station in the USA as the OM’s there were waking up. This was the first contact at the other side of the ocean for me! Shortly after a Canadian and another american contact followed. On sundays i woke up late but managed to put in a few more contacts just before formula 1 started and the closing of the contest. Then i had a few difficulties exporting the results into cabrillo format as HRD didn’t export the exchange information correctly. I managed to get the correct fileformat by exporting it to ADIF+HRD and then convert it with a logconverter. Logs can be uploaded up until upcomming weekend. I expect to end up realy low, if not last, because i didn’t realy had enough time to put into the contest (because of the formula1). In the claimed results however, i’m not deadlast so the final results might surprise me :p I consider myself winning anyways because i managed to contact the other big continent for the first time during the contest! Taking part in the European PSK DX contest, i ended up contacting the ‘other side of the ocean’ for the first time with my station. 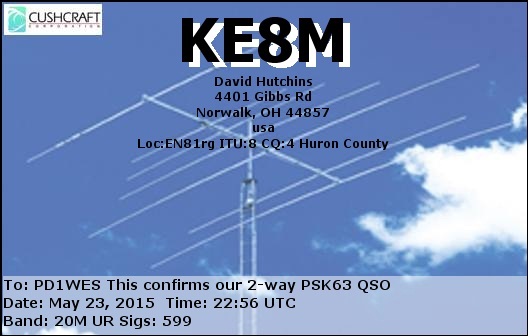 On 23th of may 2015, 22.56 zulu time (00:56 on the 24th local time at my station) i had a short contest QSO with KE8M , based in the USA.